In your estimation, who is the most famous Canadian in Canada today? I suppose Stephen Harper comes to mind… but I don’t know many Grade 2 kids who care about him. In Grade 2, the boys care about Sidney Crosby and the girls care about Avril Lavigne…but not vice-versa. It occurred to me the other day, listening to a feature on CBC, that perhaps the most famous Canadian of all, the most widely known and respected amongst kids, teens, and adults, is Terry Fox. As you may have heard, Canadian basketball star Steve Nash has made a documentary about Terry Fox’s run across Canada that ended in 1981. The Marathon of Hope lasted over five thousand kilometres, and during the year it happened, Canadians almost achieved Terry’s dream of raising one dollar for each of Canada’s 24 million people. Steve Nash was six years old back then, and used to check on Terry’s progress every morning when he got up. He was heartbroken when Terry had to stop running because of the tumours in his lungs. Thousands of Canadians were hanging on the details of Terry Fox’s story as it unfolded, and we continue to be profoundly moved by it, by this story of determination and strength beyond all reason. Every year, in every school I’ve worked in (and pretty much all the rest of them), we talk about Terry Fox to our students, to give them an example of true perseverance and amazingness. Can you name one other Canadian who has inspired so much devotion in an entire generation of households for thirty years? And you know, that makes me happy. I’m glad we’re teaching children (and reminding ourselves) that you can have crazy ideas and just do them; that you can do really hard things without complaint; that you can be a hero in all kinds of different ways; that generosity is real; that getting outside and running around is one of the best things to be done in life; and that people in this country care about each other. And on and on… The more I think about it, the more cool lessons I can see come from this one regular young guy who got sick, and got purposeful. You can hear Steve Nash’s interview in the CBC podcast from September 13th. The documentary is called “Into the Wind”, because most of Terry’s run headed him against the wind. 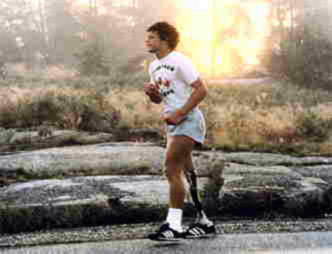 This Sunday, September 19th, is the annual Terry Fox Run. Think about getting out and running around, if you’re able. ← Multiple Steps!… and final Baby Bits? The school run/walk isn’t til the 30th…. I thought the dates would be closer. Our whole school participates every year. As I was reading this Victoria was getting ready for school. I shouted down the hall “who is the most famous Canadian, you know a real icon?” She said Terry Fox. He was amazing. I remember his run, we talked a lot about it in school especially when he was running in Ontario. It still makes me sad to this very day that he did not survive.